I grew up in the Youngstown area and now live in the Pittsburgh area. I can remember cookies tables as far back as the 1950s. My mother was a wonderful baker and friends and family would request her cookies for wedding. Things were not so sophisticated in the kitchen back then, no freezers to store the cookies in before hand. She used to start baking a week or two before the wedding. I can remember her storing some of the cookies in large fabric lined bushel baskets! My own daughter was married in 2012 and I alone baked 170 dozen cookies with a total of 285 dozen cookies! I might add very few cookies were left. On Facebook there is even a page dedicated to ” The Youngstown Cookie Table”! There are lots of cookie tables pictures there! I grew up in Y town in the 40’s and 50’s and was married there in 1959. And while we had cookies- pizzelle, bows, maybe kolachi- it was in no way as elaborate as the cookie tables of later years. I also was in 6 weddings in a 2 year span at that time and the same was true of them. I think that as wedding receptions themselves have gotten more elaborate, so have the cookie tables. Having lived in the NYC area since then, I have watched wedding receptions go from what I thought to be fancy in the 60’s, to out of sight productions today with Vienese tables ( all kinds of cookies, pastries, desserts, crepes, etc) and even a newspaper and bagels for your breakfast the next day! And so the cookie table progressed to have one more assortment at the next wedding than you had at the one before. Call it one upmanship or what have you, but I love it! Hooray for the cookie table. What you say sounds more like what I remember. But I’ve been to several recent Youngstown weddings and the cookie tables were amazing! An Italian graduation party cookie table can rival the weddings in this town! I have photos from my parents wedding in 1970, that highlight the cookie table. Photo’s because at the time you couldnt get the whole table in one shot. Im currently living in Cleveland and spent a lot of time in Western PA, and no one understands the concept of the Cookie Table. I try explaining it and I tell people that there’s this thing that as soon as you show the engagement ring the first question asked is “What do you want me to bake”. I appreciate your story and particularly verifying that your parents had a table in 1970. If you don’t mind my asking, what is your family’s ethnic heritage? A number who have reported having cookie tables years ago are from Italian backgrounds. 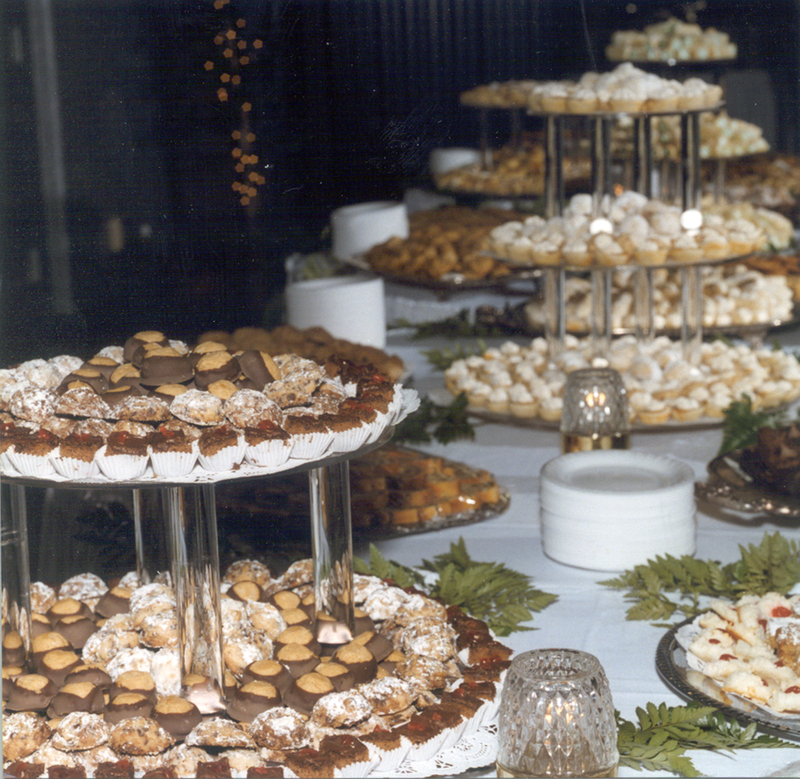 Italian Weddings in Youngstown, Ohio or anywhere always have a cookie table. I was born and raised in Struthers, Ohio in the 50’s and never went to a wedding that didn’t have a cookie table, but then again, I’m Italian. My sister’s wedding in ’73 had 26 different kinds of cookies:) The custom reaches back to Italy where all of your neighbors and the women in the family would bake cookies in celebration of the wedding. I now live in Florida, and my own wedding had a cookie table. I have had one son get married thus far. Since we were doing the rehearsal dinner (64 people), we had our cookie table there. I even had historical facts about why the Italians used cookies and Jordan Almonds for weddings. I can hardly wait till my daughter gets married so I can have the “real” cookie spread! I think if you look into it, when there’s a cookie table spread, more than likely, the bride is Italian! You are confirming something that I’ve been wondering about that I haven’t come across in stories about cookie tables that I’ve read. It does seem that many of the stories of cookie tables going way back are from those of Italian heritage. More recently though, I think this has become widely adopted in Youngstown, particularly in the last 25 years. It would be interesting to know if there are people from other ethnic groups who have this heritage. I did have someone from a German background comment on doing cookie tables. Thanks so much for your comments and stories! Update!!! Our daughter got married! Yes, there was a “cookie table!” My daughter resides in NYC, we now live in GA (we moved since my original post), and the wedding was in Hawley, PA in the Poconos. Me being 100% Italian and being the bride’s mother, of course, there was going to have to be a cookie table. We really didn’t care if anyone else than our few family members knew about the tradition as a wedding is not a wedding without a cookie table, but it was a huge hit with everyone! Being that people were coming from all over the world, seriously-3 different continents and over a dozen states, I could not ask people to bake:( I had some of my husband’s family arrive in GA the week before the wedding, and even though they are not Italian, these great ladies helped me! We made pizzelles, butterballs, delicious cookies (some with apricot solo filling and some with raspberry), thumbprints, cherry squares, Italian cookies, kolachi with poppy seed, lemon squares and cream cheese brownies! Although the wedding planner at the resort was not familiar with this custom, one of the workers was in tears when she saw the table. She was from Ohio and was part Italian and she remembered when she was younger how her grandmother used to bake for weddings. She asked if she could take a plate home! Now it has been 2 months since the wedding and one of my daughter’s friends is still asking if I will send some pizzelles up to NYC. As for my brand new son-in-law…he is still waiting for a “Christmas box of cookies”, but I think he will get some for Valentines Day instead! My parents were married in 1969 and I have seen pictures and heard the stories about the cookies. My father’s mother and her family and friends filled a deep freeze with cookies just from them for the wedding. They had almost 1,000 people at their wedding and there were plenty of cookies to go around and to take home. I can verify Alicia Mazzi’s story. I was at her parent’s wedding (at the tender age of 14! ), which if I remember correctly, was at the Mahoning Country Club. We all danced the night away with cousins, aunts and uncles; and of course, feasted on cookies. I don’t remember for sure, but I’ll bet that my mother made some cookies for the reception. Alicia’s grandparents always knew how to throw a party! Thanks for sharing your story! Must have been an awesome table! Came across the post from last year and I just had to reply !!! I got married in St Charles and my reception was at Mahoning Country Club. Sept 9th , 1967. I am Italian and Slovak so of course I had a cookie table. My Mom and aunts made all the cookies, had 450 guests !!! By today’s standards that was a top-notch affair. I live in Florida now and am planning my daughters wedding in Nov and I plan on a cookie table. Thanks for sharing your cookie table story and confirming the long tradition of cookie tables. Cookie tables were always a part of my wedding experiences as a kid. I was born in Western PA, but I grew up in Struthers. There were always cookies! We always had cookie tables at our Italian, Hungarian, Polish weddings. As far as I know it went back to the turn of the century as my Grandmother spoke of them,as well. My daughter got married in Phx last year and we couldn’t do a table because the hotel required food prep was done by them or their vendors. I baked loads of cookies and we gave goodie bags as gifts to each guest to continue the tradition. Thanks for your comment. Most histories I’ve read on the cookie table trace it to the Depression era but several comments like yours suggest they go further back, or even back to the “old countries”. Interesting! When my brother and I got married my mother enlisted the aid of her friends and my aunts to help her bake for our weddings. We had about 30 different kinds of cookies and kolachies at our reception. We even hired a special cookie lady to tray the cookies and make sure they were replenished through out the evening. The rule of thumb was 5 -6 cookies per guest and my brother had 1000 at his reception so there were thousands of cookies. To our surprise their never were many left.It was a wonderful tradition and now that we have moved away from the area we do miss it when we attend weddings. I think it’s an Italian tradition and not Youngstown. Every event I’ve gone to that is predominately Italian has a plethora of cookies. I’ve heard this from some others but also from people of other ethnic traditions who also did cookie tables. Do you know if cookie tables are popular in any part of Italy today? I grew up in Pgh and am Hungarian I remember cookie tables at both Italian and Hungarian weddings. I don’t think they are just an Eastern Ohio, Western Pa thing. I believe they are an “old country” tradition that due to the melting pot those two areas ended up being stuck with the generations. I have friends in NY City that do cookie tables (Italian). I made one for a friends wedding in Virginia years ago and one of the guest literally cried when he saw I made clothespin cookies. The last time he had them was when his Grandmother made them when he was a child. He said it brought back wonderful memories. Thanks for sharing your memories of cookie tables. I am particularly interested in what you mention about the Italian connection, which has come up in a number of comments. I would love to know if cookie tables are part of Italian weddings today, or if there is a particular part of Italy where this is done and the connection to immigrant communities. My great aunts made such a fuss over who was making what cookies at their wedding, it sucked the joy out of the tradition for them. My son graduates in couple weeks and I already have buckeyes, kolachi, and seven layer cookies in the freezer with more to come. Missy, good point. Hope you have a great graduation party. I am Pennsylvania Dutch and my husband is Italian. I never heard of a cookie table but in 1967 when we were married, my mother-in-law had at least 30 doz. cookies for our wedding. My husband’s niece got married in San Antonio TX and he transported 60 + doz. cookies from here to Texas for a cookie table. The Texans were amazed and it was one of the highlights of the reception. Not only had they never heard of one, they had never tasted some of the traditional cookies we make here. You asked about the Italy connection. My husbands grandparents migrated from Naples in the 20s. Great cookie table memories. Thanks for sharing! I grew up in Girard we always had Cookie tables at all the weddings and still do. When I married I moved to Ontario and they do not do cookie tables . Both my children have gotten married in the last 2/12 years and we did Cookie tables the response was amazing everyone loved it. My children always say you had to grow up in Girard to get the good stuff. One of the things that has been fun to hear about in comments to this post are all the places Youngstown people are spreading cookie tables. From Texas to Toronto and even further, while reconnecting with other Youngstowners to get the best cookie recipes for those tables! My Mom is Polish and there were always cookie tables at all the receptions. When I was little, children were always invited to the weddings and the wedding receptions. I started going to weddings in the early 1960’s. The whole idea of the cookie table was a light dessert until the bride and groom cut the wedding cake – then you had cake for dessert. We were taught by my Mom to take one of the small paper plates, choose three to four cookies that we wanted to take home with us, and then wrap up the plate with one of the cookie table napkins. Being a little kid it was a delight to have leftover cookies from the wedding the next day. We were also taught that you were only to take your couple cookies and that was it. Trust me, all the women that would take a large mound of cookies home under their napkins were not looked upon fondly. The gossips in the family would surely remember those ladies. It seems like cookie tables have grown. Now it almost seems like everyone is expected to take mounds, or at least a healthy goodie bag. I grew up on the North side of Youngstown in the 1950-1970’s. Most of our friends’ weddings ( Irish- Scotch) no cookie tables as I recall when little. Slovenian and Italian, yes. I was told it was Italian in origin…money usually tight, so the villagers would prepare sweet treats for bride,groom,families, and guests as they followed the couple through town visiting homes for well wishes. I married in 1975…no table. My sisters married in 1985 & 1987…cookies at both. The youngest married a boy from Columbus…guests from Columbus were stupefied! And you can’t go too far out of Y-town towards Akron,Cuyahoga Falls….no cookie table!. But towards Pittsburgh… yep!…cookies! The Lake Lure Inn&Spa?…had no inkling. In fact,when I asked about trays for about 3000 cookies as well as 12 kolachi…..the phone sent silent. So, we borrowed and scoured yard sales for trays. We cleaned up on lovely crystal or glass serving pieces and cake pedastals @ the Angels for Animals annual garage sale. We sent all the goodies in coolers with my brother. He left a day early for the resort and we watched him back out of the driveway with samples of 8 different kinds next to him on the seat in a zip lock bag. My sister and I had a moment of distrust when he jokingly aske, ” Now….what day do these need to be there?”…Good thing that even though we’re all about 60 years old?…he still fears us,haha!. They arrived,& we assembled a 24 foot display of cookies ,the likes of which the Inn had never seen. The staff kept saying,” Oh mah word?!? Thairs’ mower?! ?” in a drawl! The table was in the main hallway directly between the Main Desk and the Bar. Another wedding was scheduled the day after. Guests were checking in, eyeing the display. We paid the Staff & the Bartenders with cookies….to keep an eye on them…lol. Turns out it was unnecessary because most people just strolled over and eyeballed it. But it was a deal for the staff,lol. As you said, we sent bags home with guests & staff alike… bags and bags,especially if they had children!. Made plates for the night turn crews…boxed up the rest and headed to the family picnic the next day where we STILL had hundreds of cookies!.The Inn has a huge veranda with rocking chairs. My sister just took a huge box with an assortment… and walked the line explaining the tradition as she went. Went back to the hotel,watched the Stanley Cup playoffs in the bar…with a big box of assorted cookies. We just opened it and set it on the bar. Patrons from the OTHER wedding that was going on at the time… helped themselves !! Said they had seen it the previous day and were hoping there was going to be one at their event…thought the hotel provided it,lol. All thought it was a fabulous personal touch that some weddings are lacking today. Great cookie stories. Thanks for sharing them! My husband and I were married in 1976, had 500 people and my cookie table was as long as the food table. My sister got married in 1969, had 750 at hers and her cookie table was like mine. We’re Italian but didn’t marry Italians but the guys family’s baked much as ours did. Both of us also had tiered wedding cakes. At both weddings, our guests also took home cookies. In my family, we baked for each other. If my Mom baked for you, your Mom baked for me and so on. Family traditions! Some didn’t give up their recipes for anything. My Mom tried to get the recipe for thin wafer cookies that looked like the holy Communion wafers. Finally found someone who made them for her but wouldn’t give her the recipe!!!! Would have loved to see one of those cookie tables. Thanks for your story! My theory is that the cookie table had its roots in the coal mining towns of southwest PA where the Eastern European immigrants worked before arriving in Pittsburgh and Youngstown to work in the steel mills. They probably didn’t have the resources for wedding cakes and large receptions so wedding attendees most likely brought cookies. My husband’s grandmother was one of those women who arrived from Europe and lived near the US Steel mines before moving to Youngstown. She told me she and the other women took cookies to every wedding in their little mining town. I’ve wondered if it was something like this. That explains the Youngstown-Pittsburgh connection. Thanks for sharing your family stories! I must agree with previous comments that confirm that the cookie table is very much an Italian tradition. I married into an Italian family and the cookie tables at the weddings are both crucial and spectacular. As we are now preparing for our daughter’s wedding next month, my freezer is slowly filling with various types of cookies. I grew up in Youngstown! I am Ukrainian! I got married in 1980, and I had a massive cookie table! All my friends and relatives that I could remember way back had them, not only at weddings, but every big family event. The weddings were the larger tables. And in my travels, I saw cookies tables from New York to Minnesota! They were always in the blue collar areas. I have read that in the depression era, all the friends and family brought cookies and desserts in lieu of gifts. People didn’t have the money for that, but they had flour, sugar and lard and eggs!. In my later years, I haven brought some of those cookie traditions down south with me. In this high transient world we live in, you never know where the bride and groom families are from. I have made people go wow, with some of the cookies I can make! I am an independent pastry chef. I have suggested the dessert bar, aka cookie table, for those who have some Northern roots, and they have been very successful! When I first moved down south I had to look up what a grooms cake was! Along with cheese straws! I add a few of the newer cookies and desserts out there, but the clothespin cookies, kolachi and pittzelli are included! I love, the statement on how our mom’s, relatives and older friends will not give up their recipes. I have told them, you need to keep the traditions alive! I have been thinking of a book of recipes/traditions on the cookie table! Planning a trip to Youngstown soon! Bringing cookies!!! You may here from me again! JanTaylor! PS. I am still waiting for someone to ask me to make a Cleveland Browns Grooms cake! Jan, thanks for your comment and info about cookie tables in other cities. There is a Youngstown Cookie Table and recipes of Youngstown Facebook groups. The latter has generated 2 cookbooks. I grew up in the 70s/80s and looked forward to cookie tables of family and friends weddings and graduations. My mom and I took it one step further in the mid-2000 and had a cookie business out of our own kitchens. I have made MANY contributions to cookie tables. Ironically, the tradition had shifted that busy friends and relatives didn’t have time to make cookies, so they would hire us to do it. One of my favorite memories of living in Youngstown/Warren. Cathleen, this is an interesting commentary on modern life. “Cookie Tables for Hire”! Now there is a business idea. For me, i remember cookie tables from my youth (80s) but not them being a big deal, intil i moved away and realized that they didn’t do this everywhere. My mom bakes, bug time. She finds out the kid who sat next to her in 3rd grade’s neighbor’s cousin is getting married she starts baking about 30 dozen cookies. When i got married we(I, my wife isn’t native) came back to ytown for the event. We had it at the holiday inn on south ave and 224. As we were planning they asked us “where would you like the cookie table?” not “will you have a cookie table?” My wife took that very funny since she had heard of them through my family but it wasn’t part of her tradition and part of the reason we came back to youngstown was because when other friends got married in columbus where we live and tried to have a coockie table the venue either wouldn’t allow it or made them sign waivers saying they took the responsibility for outside food. Just to brag a bit, we had so many cookies, holiday inn ran out of trays, the tables they used, and room insude the ballroom. They had to buy more trays and move some of the cookies out to the lobby and use different tables to accommodate all the kinds. This is pretty much what I hear everywhere. Most people are clueless about cookie tables if they are not from Y’town. Thanks for your comments! My parents were married in 1966. My mothers mother was Italian and her father was German. There was a wedding cake but there was also tables of cookies. I have their wedding album with the pictures. My grandmother and her sisters and friends made everything. Thanks for sharing your memories of cookie tables going back to the Sixties! Bob, I am an Italian who graduated with your bro Jack. I love your writings on YO. Coming from a huge family, there were many weddings. There was always a cookie table!! Granted, plenty of them with a good variety but not quite the huge amount you see today. Other wedding traditions were kumbets..Italian wedding candy coated almonds and a shot of annisette for the adults as they greeted the married couple. And since pop (soda) was only a holiday treat in those days, us little kids loved that we could drink all the little 7 oz bottles of pop we wanted! Thanks for talking about “coombits”….most people have no idea what I am speaking about! Weddings I went to in the 60’ had cookies, but not tables of today. There were cookies but not elaborate. I remember women shoving them into purses, pockets, even got guys in on it. Thank,goodness little bags now available. Must admit, great memory to have.